This is a single-burner propane stove that provides up to 7,500 BTUs of heat. The grid will hold a 7-1/2" pot or pan. 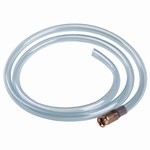 Plastic base will fit either a 16.4 or 14.1 oz disposable propane fuel cylinder (not included). Burns 5 hours at maximum setting.